This was Fatou Jaw Manneh in Norway recounting her encounter with the tyranny of the despot. She went to Washington to protest Yahya Jammeh at Obama’s US-Africa Summit. 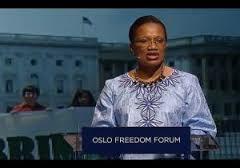 She flew to Oslo to deliver a speech on why she wouldn’t quit fighting until The Gambia is rid of this scourge. Her personal story dominated her moment on the stage, but only to serve the purpose of presenting a breathing human face of a nation under siege of cruel dictatorship to fellow freedom fighters at the Oslo Freedom Forum, dubbed the Davos of dissidents. She laid out Yahya Jammeh’s police state in its parts and the sum of its parts. The secret police at the airport and everywhere. The military checkpoints in busy city streets where the police used to control traffic. “Plain-looking” thugs at his beck and call to make their fellow countrymen disappear. The mosquito-infested filthy facilities of his notorious “National Intelligence Agency” headquarters. Citizens interrogated and prosecuted on claims of endangering national security for speaking out against his misgoverning of the country. Innocent defendants convicted on trumped-up charges because the presiding judges would rather satisfy his vindictive wrath than serve justice. Severe jail terms and penalties for stroking his ego the wrong way. Media houses set on fire or closed down for daring to stir his ire. Detentions without trial, torture, abductions, summary executions, murder and assassination as his signature methods of maintaining power through fear. Prisoners executed not on the letter and spirit of the law, but on his say-so. Families set against families, neighbors against neighbors, towns against towns, tribes against tribes for his devious purposes. The haunted nation must go through his witch-hunting exercise because his aunt paid the debt of mortality. The ready smile gone from the lips of a beautiful country thanks to his draconian desire for absolute power. Back to that godforsaken detention center that enjoys the misnomer the National Intelligence Agency. It’s neither national, just another arm of Yahya Jammeh’s repressive machinery on the taxpayers’ dime; nor is it an intelligence agency, given the crass minions and scoundrels who run it to inflict horrible harm and terrible treatments on conscientious citizens for exercising their constitutional and universal rights of free speech and association. Even someone as courageous as Fatou Jaw Manneh, who was resolved to face death at the moment of her “arrest” at the airport, couldn’t shake off certain foreboding fears. Then the interrogations began, round after round for six days and nights. In case she had any ideas to try to get comfortable in that dilapidated, desuetude factory warehouse, they subjected her to sleep deprivation. Given what she was going through one would be forgiven for assuming that she had committed a treason or she came to the country to launch an armed rebellion or incite a popular uprising. Alas, the pettiness of despots! She traveled to the country simply to pay her respects to her dad. Why were they interrogating her for being a threat to national security and for driving away investors? She had written unflattering articles online about the government and gave a critical interview to the Independent newspaper that was soon attacked by the regime arsonists before it was eventually shut down for good. After her speech, she sat down for an exclusive interview with The Oslo Times, Norway’s largest English-language newspaper, and was asked what were the things she hated the most about her detention and what she felt were against her rights. She responded: “Well, they arrested and detained me for six days before taking me to court. I was dumped in a mosquito-infested room for six days and nights during which I slept on the floor and my whole body was red and swollen due to mosquitoes bite. Most Gambians, after they get arrested are beaten and tortured seriously and spend months if not years before they are charged with anything. I went through series of interrogations, but I was lucky for not being tortured like my countrymen. “I am from a small and once peaceful country called Gambia. But just exactly as I had stated in the ‘The Independent Interview,’ these military boys who took over in 1994, contrary to their promise of good governance, have turned out to be nothing but a bunch of greedy, misguided, bullies who have invaded Gambia’s democratic space. President Jammeh is a cruel leader who spares none on his road to power and to secure his position for eternity. His government has no respect for the rule of the law. He is killing, jailing, torturing and threatening innocent Gambians by dragging them to the courts for just instilling fear in them of him.